I was a bit of an emotional mess last spring when I realized my oldest was going to be in first grade this year. Where does the time go, anyway?? But now we’ve got a few weeks of it under our belts and I have to say, it’s lovely. 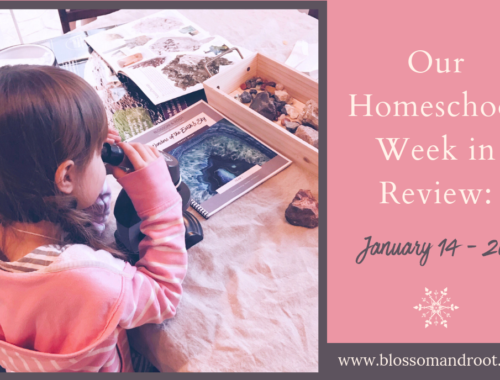 She’s at the wonderful stage where she has more questions and ideas spilling forth every day that I can manage to catch, and I love seeing where each week of homeschooling will take us. 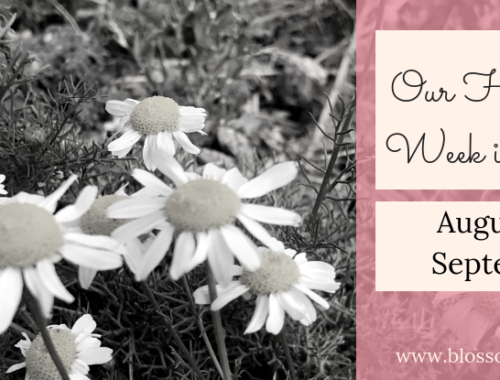 As with my youngest, I wanted to let my oldest tell her story in a “point of view” post. She chose all of the pictures that she wanted to use, and I’ve recorded her captions for each one. I hope you enjoy this glance into our nature-based first grade, through my daughter’s eyes! As with my youngest, my oldest likes to start her day with math. Blake is using several things this year for math. 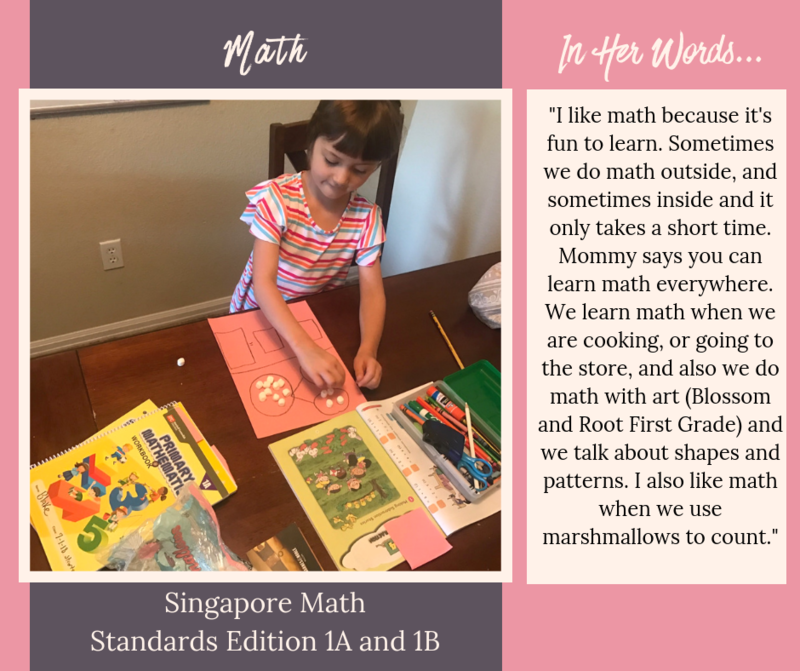 Singapore Math (standards edition) is our main curriculum, but we also use Wild Math First Grade, Blossom and Root First Grade: Exploring the Math in Art, and lots of games. I had considered a switch to Right Start Math this year, but ultimately decided to stick with Singapore. Blake really loves the way it’s laid out, and it seems to really click with her. We usually don’t spend more than ten minutes on our math lesson for the day. Literature and reading usually follows math, and we take a little longer for them each day–about half an hour. 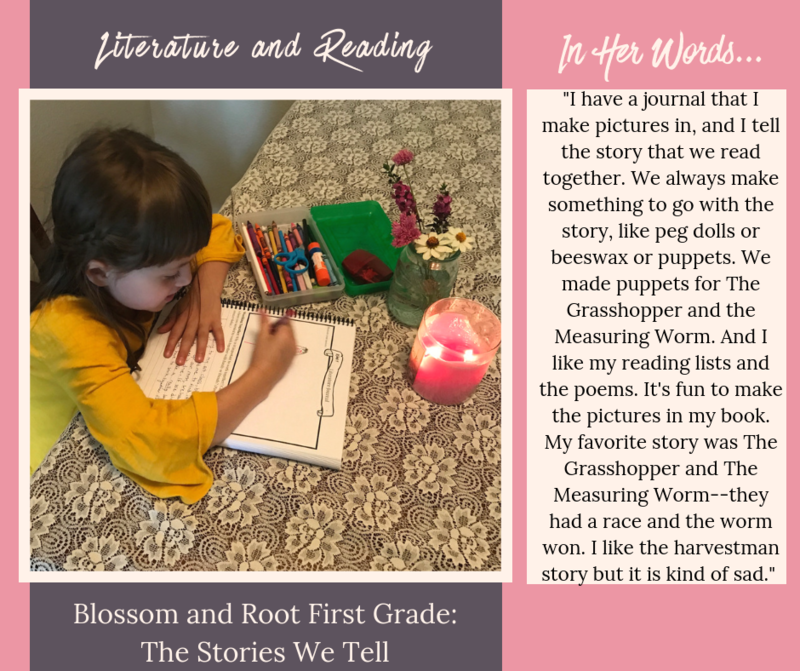 We use Blossom and Root First Grade: The Stories We Tell. We read stories together, then complete various activities to explore narration of the story together. Blake also does a little bit of work in the corresponding notebook each day: prompted journal entries that explore the themes in the stories, narrations, cut-and-paste poetry, and copywork. I often do the bulk of the writing for her so that she can concentrate on sharing her ideas without being overwhelmed with spelling, grammar, and handwriting at this early stage. We also build words from her word lists with letter tiles and magnets. Science is one of Blake’s favorite subjects! 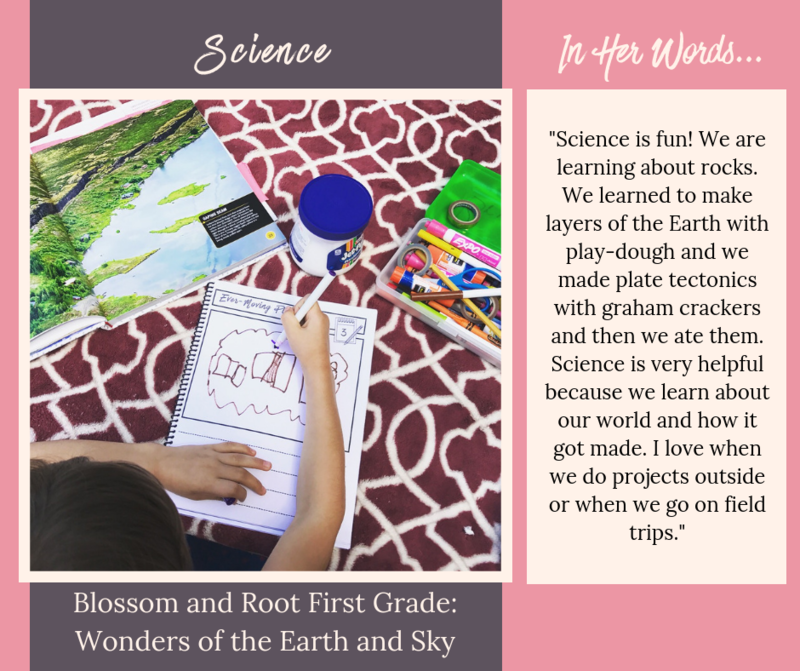 We are using Blossom and Root First Grade: Wonders of the Earth and Sky to explore geology, seasons, and weather this year. 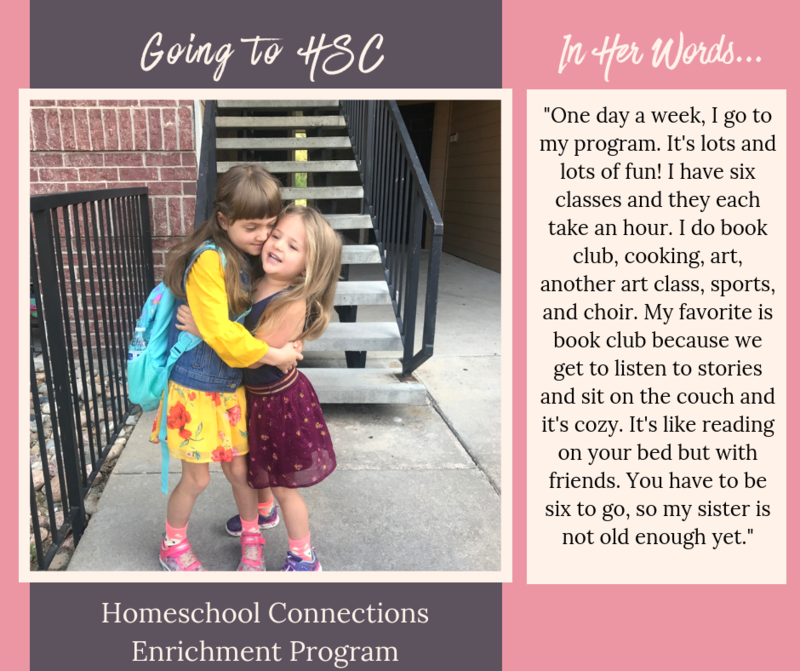 I designed this curriculum around the concept of choosing our own adventures each week, and we are having so much fun! We also use Blossom and Root Book Seeds to add extra science to our week. We aren’t using a curriculum for history right now. I’ve selected the units I want us to cover this year (Native Americans, the first colonists, Ancient Egypt, Ancient Greece, and Ancient Rome) and we will cover them by reading lots of books, watching movies, and going on lots of field trips. 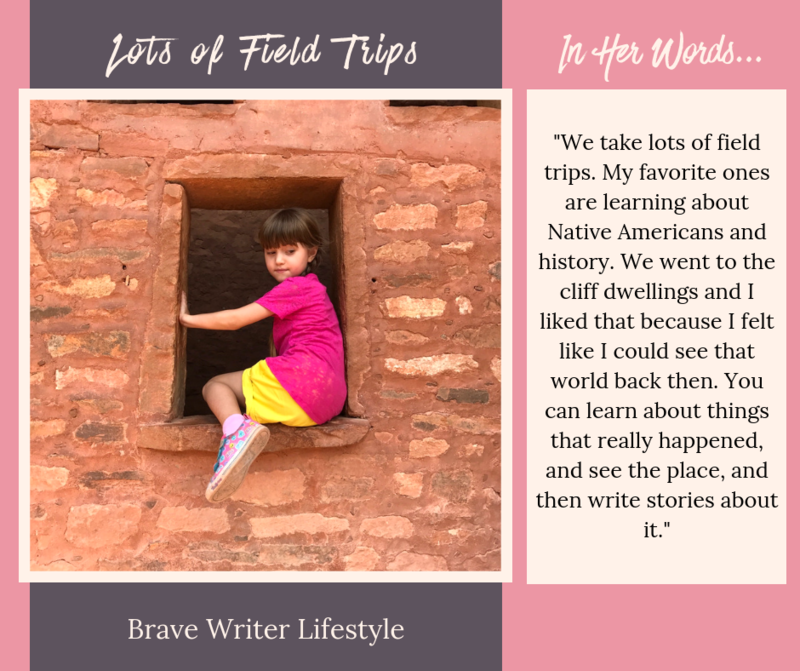 We’re deep into our Native Americans unit right now, and spent a day at the Manitou Cliff Dwellings. Blake absolutely loved this field trip, and she learned so much while exploring the grounds. She writes wonderful stories about the things she learns on our adventures. As with my youngest, I try to make time for kitchen classroom every week with Blake. 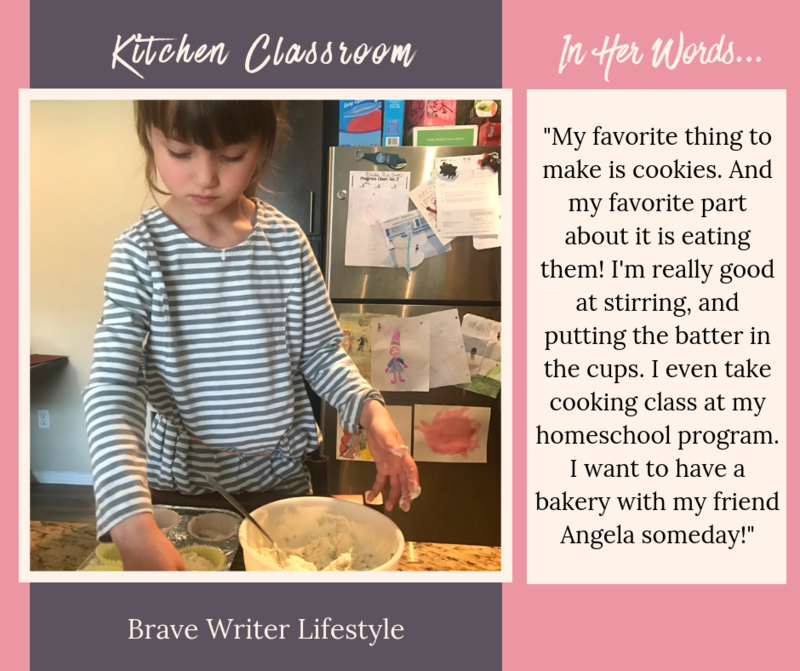 She is actually enrolled in cooking classes at her homeschool enrichment program, but it could never take the place of cozy afternoons baking bread or cookies at home. We usually make our treats for our poetry teatime. There are so many things to be learned while cooking and baking: math, science, reading, nutrition, even history and geography! I discovered modeling beeswax about a year ago from Waldorf blogs I was following, but this is the first year I’ve made an intentional effort to use it. We’ve found that it fits seamlessly into many of our subjects. My favorite marriage is between beeswax and nature study. 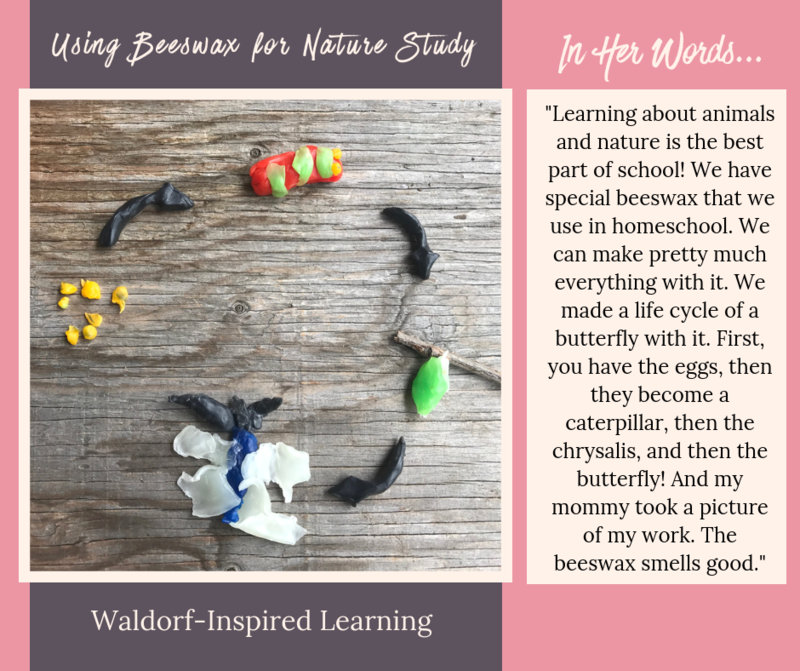 Whatever we are studying, we love making it out of beeswax! Blake was really proud of her butterfly life cycle. There’s something so therapeutic and warming about molding the wax into beautiful figures while we read and learn. We’ve started using the Big Life Journal once a week this year, and–wow–it is such a meaningful addition to our homeschool! We’ve had some really great conversations over it already. 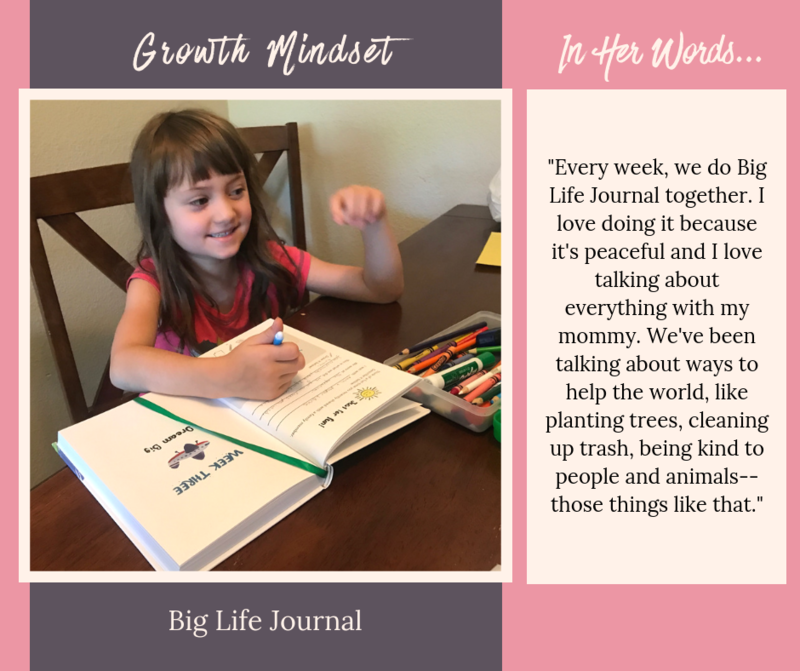 The focus of the Big Life Journal is the development of a growth mindset, but I love how it also emphasizes kindness and thoughtfulness for others. Highly recommend! 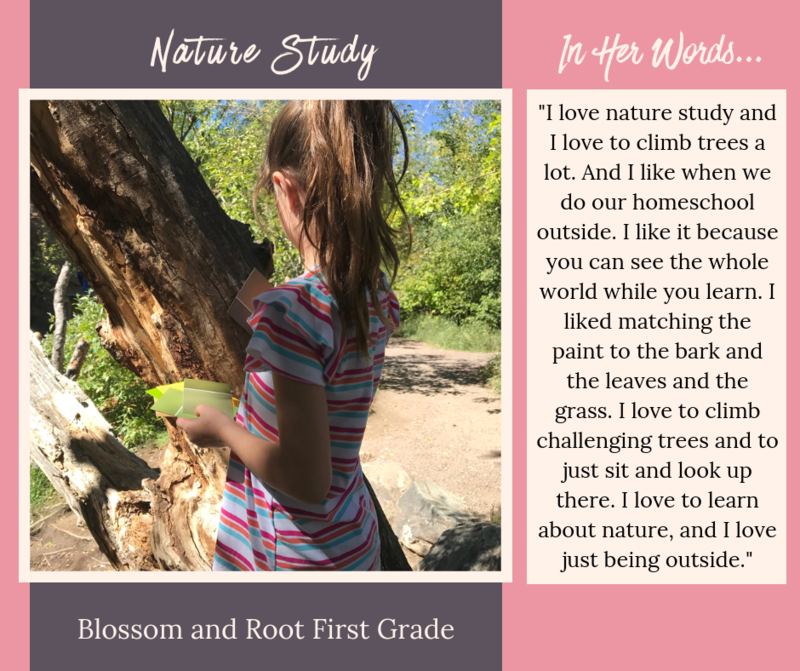 Nature study is one of the most important facets of our homeschool rhythm, and we try to include it several times a week. 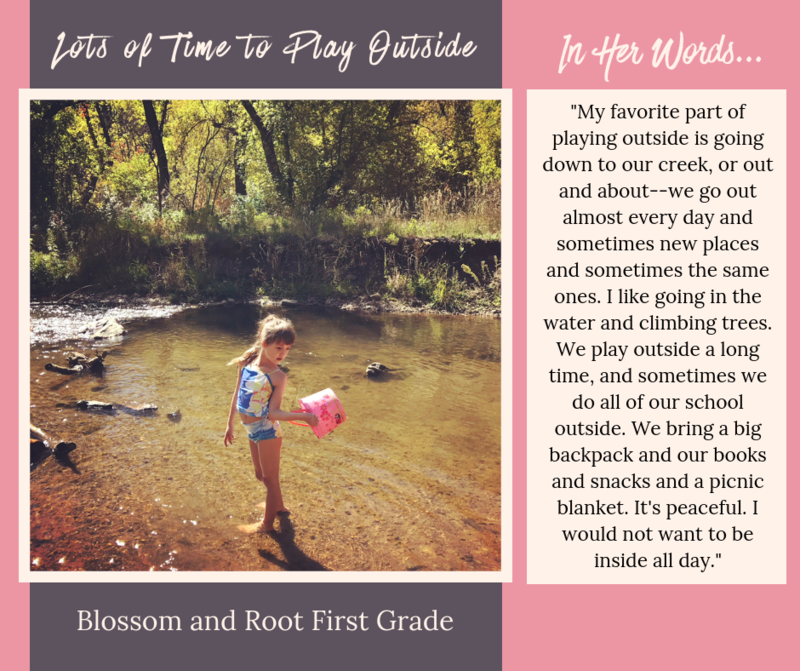 Sometimes we use a curriculum (like Blossom and Root First Grade or the Book Seeds series) and sometimes we just get out and explore. Whatever catches our interest, we come home and look it up in our growing library of nature guides and resources. 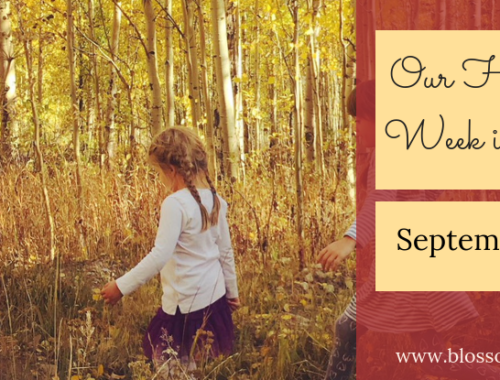 I have so many happy memories already of doing nature study with the girls–learning about tent caterpillars after discovering them in the Rocky Mountains one summer, learning the differences between all of the evergreen trees, doing pond studies, etc. This past weekend, we did the “Paint Sample Color Matching” activity from Blossom and Root First Grade. Blake loved it so much, she asked if we could come back to it when the leaves had turned more to find reds and oranges, too. I love when she comes up with extension ideas on her own. 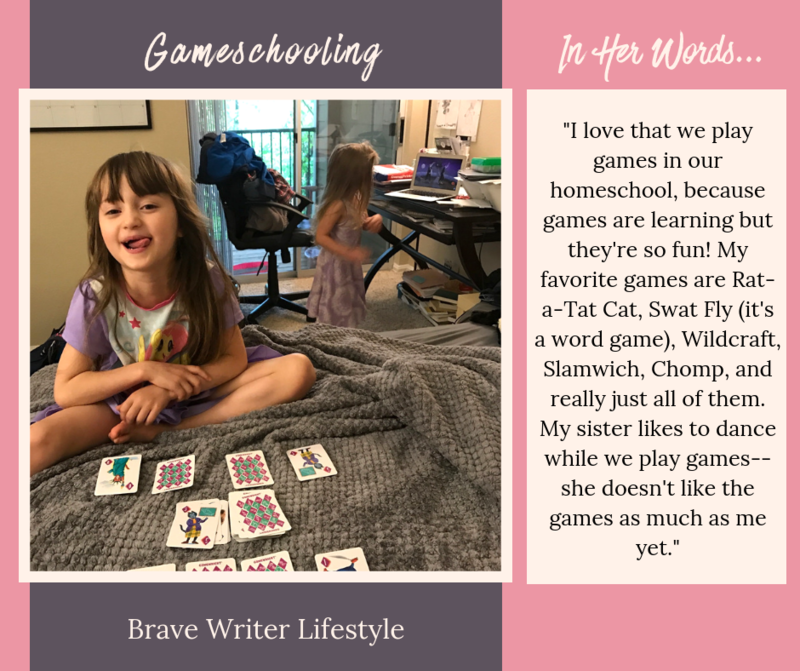 Nothing puts a smile on Blake’s face faster than the suggestion that we “do games for math today” or “play a word game while we eat snack.” She is super competitive and can’t get enough of card games and board games. She’s a good sport, and shows grace both in winning and losing. Brice (her little sister) really likes to play when she’s alone with me or my husband, but she isn’t a big fan of playing with Blake just yet, so she usually dances to her special YouTube mix while we play. Once a week, Blake attends a homeschool enrichment program nearby. This program was such a happy discovery! She got to choose from a variety of classes, and has made so many friends already. Her classes include book club, cooking, two different art classes, choir, and sports / games. It’s wonderful for her–she gets to play with other kids and dig into materials we don’t really have at home–and for Brice, because she gets some precious alone time with me and my husband. If we do one thing consistently, it’s reading. We read to start our day, we read during snack and poetry teatime, and we read to end our day. We take field trips to libraries and used book stores, and haul grocery sacks of books on hikes and to gymnastics classes. We listen to hours and hours of audiobooks while we drive around town. We probably spend fifteen hours a week reading or being read-to, on average. We read fiction and non-fiction and poetry and cereal boxes. 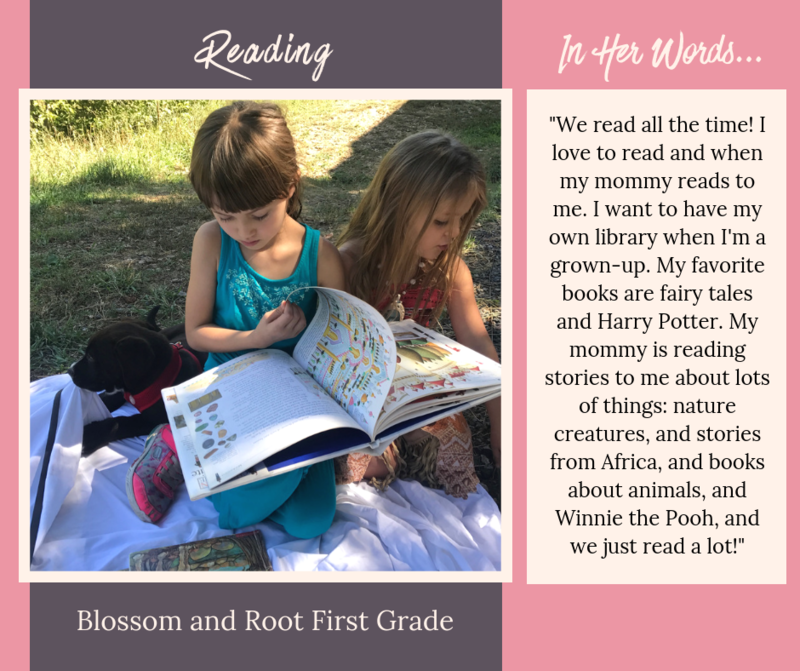 I made it my mission when the girls were born to read to them every single night of their lives while in my care, and the nights we haven’t have been few and far between. It makes my heart so happy that they are learning to love books as much as I do! What’s your favorite part of your year so far? Please share in the comments! 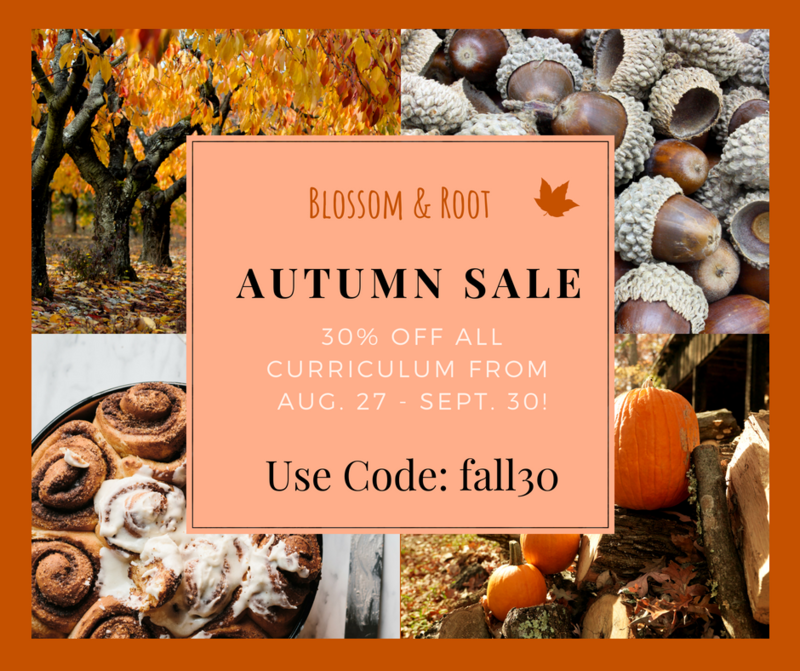 Click here to learn more about Blossom and Root First Grade! 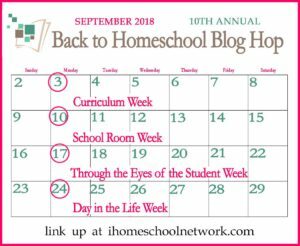 Read more posts through the eyes of homeschool students on the iHomeschool Network Back-t0-School Blog Hop! Click here to read more posts! What a lovely combination of resources! I love how much you play and read.